Machine Baby is a stylishly shot short horror that really is something quite surreal. This award winning piece (GenreBlast Film Festival award for 'Best WTF Short Film') was written and directed by Sean Richard Budde and has recently been available to freely watch as part of Bloody Disgusting's World of Death series (episode 125). I shall be including the short below my review, at just 10 minutes it is worth a gander. This is a darn weird film but one that uses some interesting tactics to feel unique. The start is near perfection in the disorientating fashion it starts. There was a epilepsy warning at the beginning that I paid no heed to, but the introduction of a strobe light that gets more and more intense, coupled with a song that gets stuck on a small loop, married to the visuals of the manager whispering something to his on stage Miss California client made me feel quite dazed and almost unwell! It was a memorable beginning and was nice to see things stay almost as strange for the rest of this. The horror begins in earnest at around the 4 minute mark, by this point the setup has been established, and the oddness is deeply ingrained with a room full of gas cans in which a woman in the background is crazily guzzling from them. Gray is the best character here, he exudes a sense of menace about him that applies even when he isn't talking. It leads up to a fun The Shining moment, and a stab effect that works fantastically due to the great prolonged gurgling noise used. 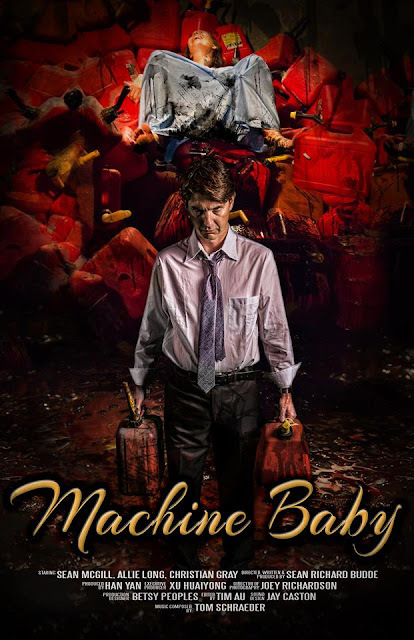 As the title kind of hints at there is a birth here, and this was my only real issue with Machine Baby in that I don't really see how something that large could come out of a person. This occurs off camera so I don't think it was really known how to show this. The editing felt slightly off at times, such as when a character is dragged to the ground, but the transition goes from him standing up in one shot to laying on his back in the next and so seemed a bit unnatural. I did love the ending though, it almost matched the beginning in terms of captivation despite the end of the story taking place over the blackness of the end credits just as audio. Machine Baby is a strange short, but it stands out due to this. There is a lot of quality on show that you might not necessarily expect, while the bizarre droning soundtrack and great sound design added a lot of atmosphere. Aside from a couple of bits of editing, and one character who looked the part but didn't necessarily sound the part this was a decent little horror that has a fun exploration of where vapid beauty pageant contestants could actually originate from.